It's time for this week's Christmas Card Challenge. This week the challenge is to make a Christmas, Holiday or Winter card using buttons and twine. I just love using buttons and twine and I have a lot of both in my stash!! For this card I used decorative paper from Crate Paper and a Hero Arts Gingerbread Man. I colored the Gingerbread Man with Copics and added Red Stickles and white pompoms to his Santa hat. Then I added green buttons and covered them with Diamond Stickles so they would be glittery. I added twine at the bottom - it's from Papertry Ink. I hope you will join us this week at Christmas Card Challenges. This is a really fun one. I can't wait to see what you make! What a great way to get a jump on your Christmas cards, this gingerbread card is adorable and the sparkly Santa hat is a great addition! Deborah! I think you won a prize at the Mixed Media Monthly blog!! You might want to check it out!! 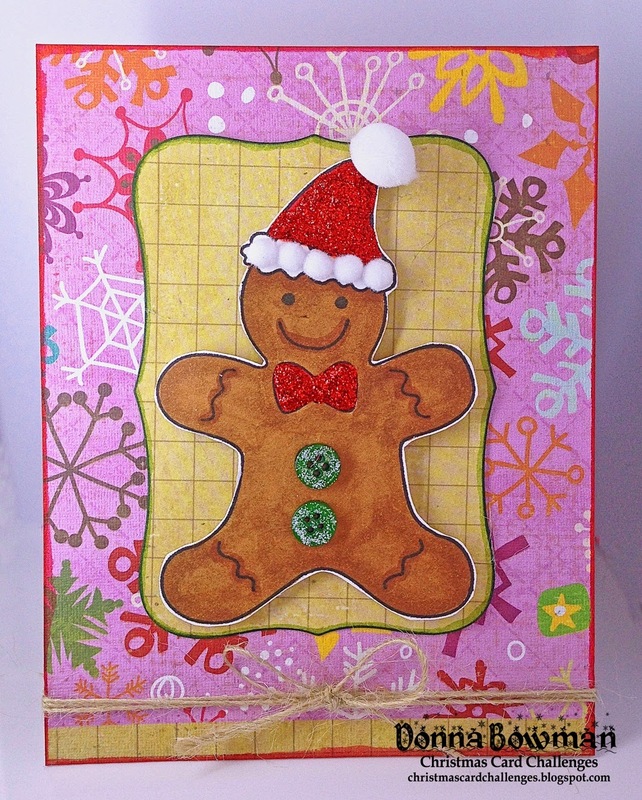 Wow, Donna, a really cute and fun Gingerbread Man and a really pretty card too! So cute! Love the stickles! !